In recent decades, California has pursued minimum wage levels about the federal standard. By 2022, the state will have the first statewide minimum wage of $15.00 per hour. The Golden State’s minimum wage experience thus offers a unique opportunity for researchers to examine the longer-term economic effects of high minimum wages. 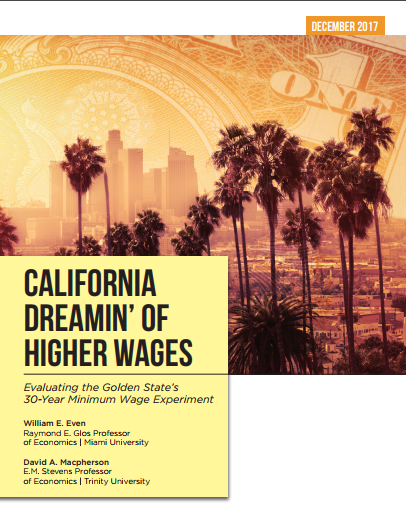 In this new study, Dr. David Macpherson of Trinity University and Dr. William Even of Miami University measure the empirical effects of minimum wage increases in California from 1990 to the present, and estimate the impact of California’s current minimum wage law. Even and Macpherson adopt a novel approach to measure minimum wage impacts, examining the impacts of a rising minimum wage on private sector employment across county-industry pairs between 24 counties and 15 industries in California. Over nearly three decades of data, the economists attempt to isolate the employment impact of a rising minimum wage from broader trends in California’s economy--for instance, the substantial decline in manufacturing employment in Los Angeles County. In total, the authors employ 24 unique variations of their original model to ensure as fair a treatment of the evidence as reasonably possible. Their findings are stark: The economists’ preferred model show that past minimum wage increases in California have caused a measurable decrease in employment among affected employees. Specifically, they find that each 10% increase in the minimum wage has lead to a nearly five-percent reduction in employment in industries with a higher percentage of lower-paid employees. Across all industries, their findings imply that each 10% increase in California’s minimum wage has reduced employment for affected employees by two percent. The authors apply these estimates to the state’s forthcoming $15 minimum wage. By 2022, approximately 400,000 jobs would be lost as a consequence. (This estimate is conservative, as it measures the impact of California’s state minimum wage but does not covering the impact of local minimum wages.) Industries with the greatest number of affected employees are most severely affected by job loss, according to Even and Macpherson; nearly half of the observed job loss occurs in foodservice and retail industries. Real firms outside of an economic model could respond to higher minimum wages in ways that cause somewhat divergent effects. And whether the real-time response of an economy will mitigate or exacerbate the effects of raising the minimum wage is an open question. What is not in dispute, based on this study, is that California’s rising minimum wage has depressed employment opportunities in the most heavily-impacted industries. The conclusions should give pause to states or localities interested in emulating California’s wage experiment.